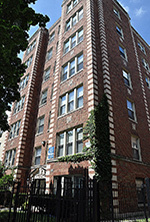 1628 W. Sherwin apartments offer condo quality renovations on a quiet, tree-lined street in north East Rogers Park. The building is a 43 apartment, vintage elevator building that has been completely restored to its original elegance. Apartments offer new kitchens, restored hardwood floors, and large windows (top floors have views of downtown and the lake). The property is ideally located two blocks from the Jarvis L stop (red line), and three blocks from the lake (east) and the new Gateway shopping center (west). 1628 is the ideal place for the selective resident who values a remodeled apartment and a quality living community at an affordable price.